"George Saunders has written the best book you'll read this year." That was the headline in the New York Times in January of 2013, proclaiming "Tenth of December," Saunders' fourth short story collection, to the best of the best. Where do you go from there? What happens when you've hit the top? If you're Saunders, you wince — just a little bit. Then you get back to work. "I think it was a blessing," Saunders said of the rave review. "I'm not 20. In a way, it was late enough in the game where I understood it as a lucky thing that we could have some fun with." Saunders, who just turned 57, once worried that his writing career would never take off. In his early 30s, he was working as a technical writer, tucked away in an office in Rochester, N.Y.
"I could understand that not only did the world not care if I was a writer, it kind of preferred it," Saunders joked. "It would be better for everybody if I would just stop." The office job forced him to slow down. He would squeeze in writing time whenever he could, often only 20 minutes at a time. "It was like my gaze readjusted," Saunders said. "Revision started to become a real important part. I've had stories I worked on for 14 years." With age, Saunders said, came the realization that it's trickier to write about the positive aspects in life. Dark can be easier than light. "There is an edginess that is easy. To be more hopeful is harder," Saunders said. "To say, 'life is sometimes a drag, our culture's messed up' — those things are kind of low-hanging fruit. To be able to say, on the other hand, 'I find life gorgeous, people sometimes do have positive things to say and do' — that second thing, at least in fiction, is harder." Saunders continues to write short stories and is a frequent contributor to The New Yorker. He's also on tour with a new edition of a children's book he wrote for his daughters, "The Very Persistent Gappers of Frip." Revising that story took so long his daughters had outgrown the tale by the time he was finished. Still, revision for Saunders is what makes writing come to life. "If I type up a story or an essay right now, it would just be an old dude yapping," Saunders said. "But if you give me 6 or 7 months, I can kind of interrogate my own nonsense through revision, and a better, kinder, smarter, funnier person emerges that I never am in real life. That's the addictive part of writing, you can actually coax out of yourself a more wonderful presence." 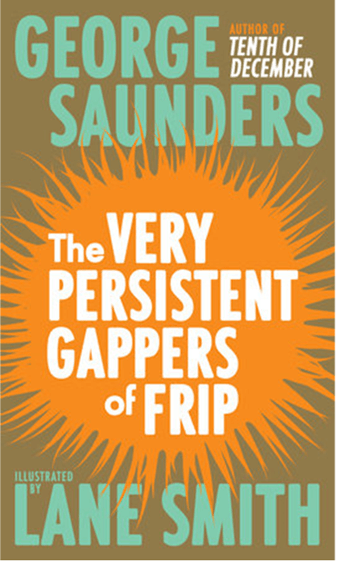 George Saunders will read from "The Very Persistent Gappers of Frip" at Macalester College on Dec. 7, at 7 p.m. More details are available from Rain Taxi.